Today sees England begin their Euro 2012 campaign as underdogs versus the much fancied French, but are Manchester United fans really as ‘Anti-Ingerlund’ as they make out? If you fancy a bet on the England National Squad and you do fancy their chances, there’s plenty of so-called ‘value’ in the market thanks to unusually low expectations on the team. I’ve been surprised by the amount of ‘Come on England’ tweets littering my Twitter timeline considering the followers of @Red_Rants are obviously 99% United fans. With the fashionable stance amongst United fans (which has been fashionable for many years now) to publicly and vociferously detest England and its ‘Anti-Manchester United’ supporters, it’s refreshing (to me) to see so many messages of good will towards the team. Down the years it’s been well publicised that during England fixtures (friendlies or competitive matches alike) supporters of clubs throughout England have feverishly shown their dislike of United and its fans, with “Stand up, if you hate Man U” being the song of choice for many to aim at any United players present in the squad. Couple that with the distasteful scapegoating of United players such as David Beckham in ’98 and later Wayne Rooney in ’06, and there’s ample reason for any English born United fan to take umbrage with supporting or supporters of the national team. 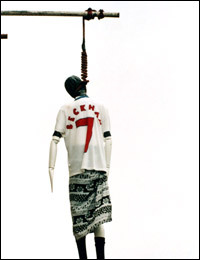 The most distasteful incident happened in ’98 when an effigy of David Beckham was seen hanging by a noose round its neck outside Upton Park, home of West Ham United; arguably a club whose fans despise Manchester United even more than most and the club closest to David’s birthplace. The FA don’t help either, the instances of unfair trials and punishments dished out to indisciplined United players in comparison to other clubs’ players for similar instances of indiscipline are plentiful. (For a complete run down of these see the excellent article written by Scott at The Republik of Mancunia just a few weeks ago). Scott’s stance is opposite to mine and I wouldn’t agree that United fans support or literally cheer on the likes of Terry or Lampard (well certainly not me anyway) they just put their club loyalties to one side as I’m guessing most supporters of the vast majority of clubs around the World do when their national team are in action, such is the aptitude and the life of the fickle football fan. However, there is one major discrepancy. When England play during the season, whether it be a qualifier or a friendly, the support from United fans does appear to be more ‘Anti-Ingerlund’, it’s as if England don’t matter at a time when United are fighting on all fronts to overcome the challenges before them. When the summer comes round and it’s tournament time, it’s all about England and the interest grows from “I’m really not that arsed about England” to “Come on England”, for me I don’t see a problem with that, it’s all about priorities, United are my priority, if West Ham, Chelsea or Sheffield Wednesday fans want to put their country before their team that’s entirely their call, but it’s not for me. The hating of England has become a ‘badge of honour’ for many United fans who see it as a way of expressing their support. England, I think it’s fair to say, is a very unpopular country/nation nowadays anyway, and with the explosion of the foreign legion (of United fans) in recent years (and I include the huge and unbelievably dedicated Irish contingency [who I know many of and respect all] in that) it’s no surprise to me that the ‘Ingerlund’ bandwagon has been encouraged and gathered so much pace. Whichever side of the fence you’re on or even if you’re choosing to sit on top of it (quietly), England do play tonight and I’m sure the vast majority of us will switch on to see it regardless of our prejudices or loyalties. One’s thing I have no doubt about, is the support United fans will give players representing the club who have provided England with not only its highest ever goalscorer, but the most number of players too, Manchester United. If you fancy a patriotic flutter or a serious punt why not check out the latest odds with William Hill. You can get 5/2 on England causing an upset and 18/5 for Danny Welbeck or Ashley Young to score the first goal of the game. As a non english united supporter i wish England well, but my main concern is (& always will be) were england are concerned that the United lads dont get injured on England duty. Find it hard to muster any sort of support for England…mainly due to the unbelievable hype that normally surrounds their participation in major tournaments. I almost found a small sembling of support until this morning when i turned on the radio and …BOOM their was hype being ramped up..due to the low expectations apparently Ingurland are now the dark horse favourites. National team performance measure something different from Club’s one, you need to be more team players, I think only thingy lacking from England is that willpower of each players to be a team. Supporters hate/like to some faction of England squad players clearly hamper the process which gel all players into one team. @Junping Jesus: Terry would still stumble onto trophy celebration and hoist trophy as his own. To keep Terry away from Trophy celebrations, you need 2-3 teammates’ wives in lingerie and Abramovic with a suitcase full of cash. THEN Terry will become distracted and forget about the trophy. One Love , one loyalty Manchester United . Any game with a United player in it ,is to be watched . 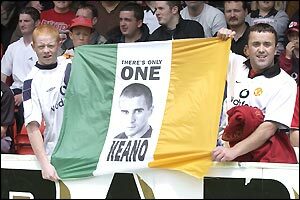 Im not being fashionable ,I just remember how for example the FA made an example of our players! Rio for example . Then cover up far worse events in the interests of the game .Hypocrites.The list is endless . England = Gerrard + Terry + City + Liverpool players… disgusting team. Can’t support it. I support Welbeck, Young, and maybe Rooney but only as individuals. That was a cowardly performance of epic proportions. Desperate ten men defending and lots of poor touch and passing. Kind of reminded me of the game at the Etihad but at least England have a good LB. Nobody can pass calmly manner, No central play-maker either. Pretty sure even Rooney comeback into this team won’t make slight difference, Welbeck try but I think he is not yet can cut the mustard as a leading striker. Defensive shape is pretty solid but it is more likely France cannot use width effectively. I’m really torn on England. With the Rio snub and John Terry, I have every reason to cheer for their quick demise…BUT, Jones, Young, Welbeck, Rooney are compelling reasons to cheer for a long run.